Many people outside of Russia are still unfamiliar with much of the countries’ cuisine. To stop diners from missing out on this tasty and varied eating experience, we’ve created a short list of the 4 Russian dishes that every foodie absolutely must try. Beef Stroganoff is one of the most famous of all Russian cuisine and a feature of many family mealtimes throughout the western world. 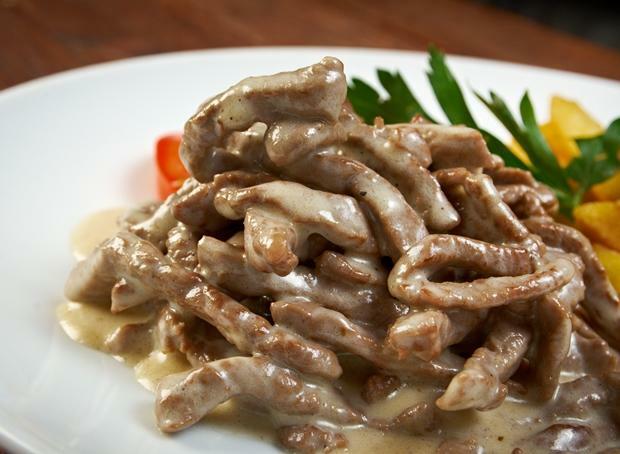 The dish is a perfect marriage of mushrooms, onion and sliced beef fillet cooked in a sour cream and white wine sauce. There are a wide variety of different versions of the recipe, with some calling for the use of paprika, mustard or tomato paste. The legend behind the dish is that Stroganovs, a merchant family with immense amounts of power and wealth during the Tsars’ reign lended their name to it. Could there be a better way to be immortalised in history than being the namesake for one of the most iconic Russian dishes? Where you should try it: Cafe Pushkin in Moscow is known for serving legendary stroganoff. Their version comes with chipped and roasted potatoes and an exquisitely rich gravy that will fill your belly and warm your heart. If you’re out and about in London (UK), the Russian restaurant in Mayfair, Babel House, offers a modern European twist on Beef Stroganoff along with many of their other amazing Russian dishes. 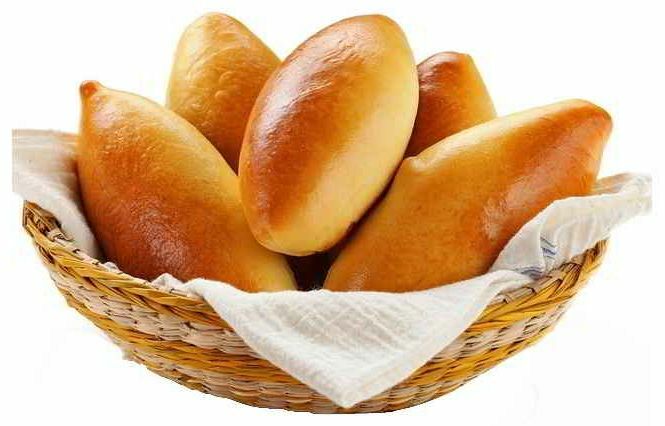 Pirozhki means, when translated, ‘little pies’ and are basically stuffed pastry buns with vegetables and meat on the inside, along with herbs and cheese to add some flavour. This is a popular dish in Russia at Christmas and is passed around while guests wait for the elaborate feast to be prepared by grandmas and aunties. They are sometimes Sometimes pirozhki is fried or baked, and it sometimes comes in sweet versions with lots of cottage cheese, cherries, stewed apples or jam oozing out of them. Where you should try it: This is easy to eat on the go using just one hand and is therefore one of the most popular and widely available street foods in Russia. Vendors often set up their stalls on the corner of streets and in parks. Some of the most popular pirozhki in St Petersburg is found at Pirozhkova along Moskovsky Street, an old-school bakery that delivers a tasty punch. Look at pelmeni as the Russian equivalent to boiled dumplings. Though, there is a belief that its origins are as far back as the 15th century when the Chinese merchants were visiting Siberia. Made using unleavened dough, these are bite-sized hot parcels that have been stuffed with ground beef, pork or lamb and spices, pepper, garlic and onion. Perfect in colder climates, the Siberians used to heat these up in large batches, making sure they had enough meat to keep them healthy over the harsh winter. Where you should you try it: This dish is loved all over the country, but the best place to eat it is Siberia. Real Zames in the town of Irkutsk is a lovely little eatery that makes a wonderful array of pelmeni, including the traditional Siberian Baikal fish variety and more adventurous types such as those with beef and cheese in a pesto sauce. 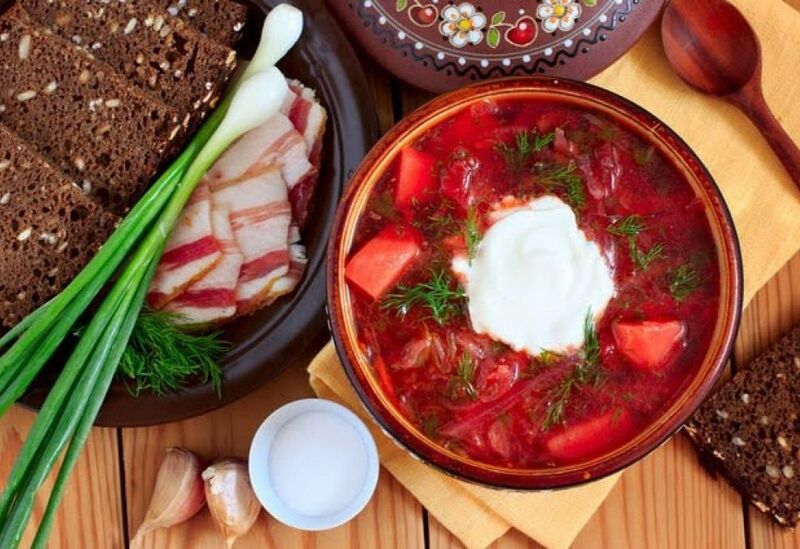 While it is true that it is considered one of the most iconic of all Russian dishes, Borscht actually originates in Ukraine and loved throughout the Slavic region. This is a beet-based soup that features a wonderful array of hidden treats. Typically it will feature a number of different kinds of meat along with sauteed potatoes, onion, carrot and cabbage. It is normally served cold or hold with a healthy dollop of sour cream. Where should you try it: It is found in both homely little cafes and high-end restaurants. Grand Cafe Dr Zhivago, found in the National Hotel Moscow is famous for its truly decadent take on this dish with chunky pieces of Vienna sausage, ham and beef. In conclusion, it would be impossible to list every Russian dish in one post, but for beginners to the cuisine, this will get you started nicely.